Light of the Diddicoy, the historical novel about Brooklyn's waterfront gangs as told by a 14 year-old Irish emigrant, is continuing to surprise the book industry and gain momentum. New interest is popping up in different areas, including Europe as the Amazon.co.uk release happened recently. Dublin continues to be a hotspot and, surprisingly, London as well. Thanks to you, our readers, this book is breaking new ground and turning heads all over the place. Recently, Declan Burke, who runs the most popular Crime blog, called Crime Always Pays, recently featured Light of the Diddicoy here. Apparently, we all thought Light of the Diddicoy was just a "Historical Novel," but a whole new genre has picked it up and called this book its own in the Crime/Thriller/Mystery circles. Who knew? 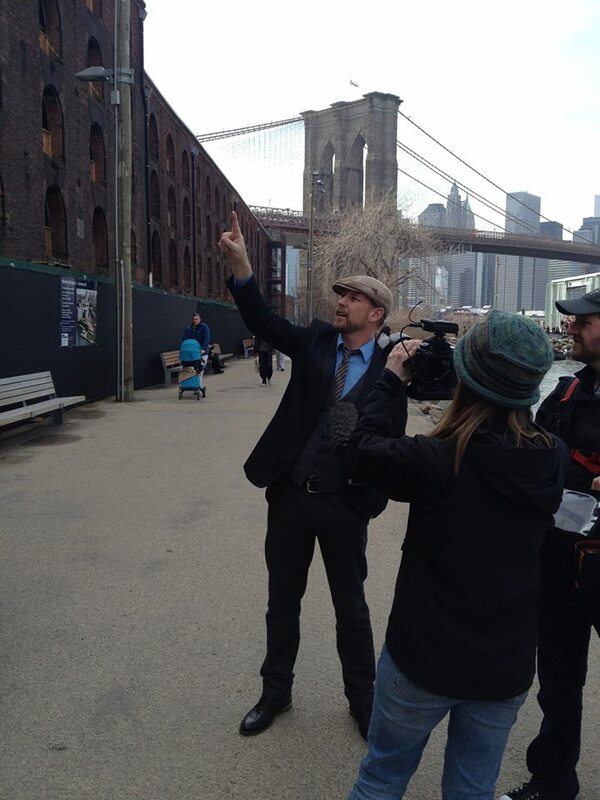 Also recently, a film crew followed me around the locations in Brooklyn where the book takes place, such as 25 Bridge Street, which was the White Hand Gang's headquarters under the Manhattan Bridge and the historic Empire Stores warehousing units (see picture above) in-between the bridges where ships brought in coffee and tobacco that were unloaded by the gang's longshoremen and housed up in those iron-shutter windows. Earlier in the day, WBAI Radio-NYC host John McDonough interviewed me down at Rocky Sullivan's in Red Hook about the book and the Irish Republican and New York history featured in it. Afterward, the camera crew and many others followed us to sell copies of the book at Spoonbill & Sugartown Booksellers up on Bedford Avenue in Williamsburg. Finally, we are closing in on readings at the Ireland's Great Hunger Museum in Quinnipiac and in Hartford, CT, Oceanside, New York (where I was born!) as well as a few in the Mid-Atlantic regions and in Tampa and St. Petersburg, Florida. 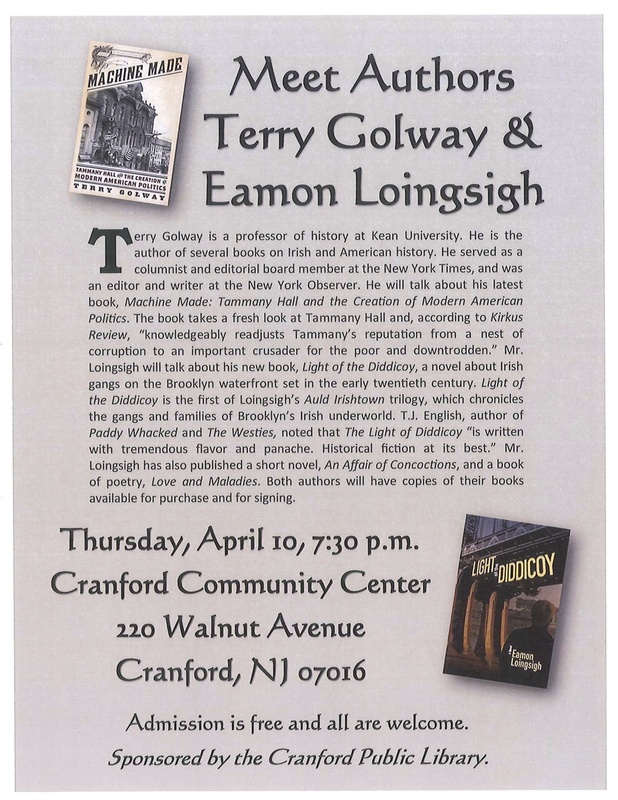 But first, I am honored to be reading with Terry Golway, an established writer and Kean University professor, historian and author of the great non-fiction book that was recently released called Machine Made which redefines Tammany Hall's role in New York City politics. For more information about Light of the Diddicoy, or to request interviews and schedule readings/appearances, please contact Three Rooms Press at info@threeroomspress.com. Get your copy at a local bookstore, or go here at amazon or here at Barnes & Noble.